I have a long, not too wide living room with two large walls with the sofa on one wall and a pine unit, with the TV, on the opposite wall. I also have a lower wall where the stairs are with another two seater sofa. Is there any other way I can arrange my furniture? I'm afraid I can be of little help without knowing the size of the furniture and the walls and what other furniture you may have. 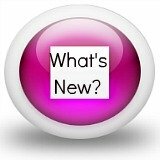 What is it about the current layout that you don't like? Also, how is the room used? If it is used mainly as a lounge/TV room, then the way you have it now is a very practical one with both sofas having a view of the TV. If the room is used as a lounge/diner, you may like to consider using either the sofa or the unit as a divider to cut the room into two clearly defined spaces. If the room is quite long and narrow, having the two largest pieces of furniture on the longest walls may make the room seem more corridor-like. Will either of these bigger pieces fit on the shorter walls? This would give the illusion of making the room seem not quite as long and wider - in other words slightly squarer. 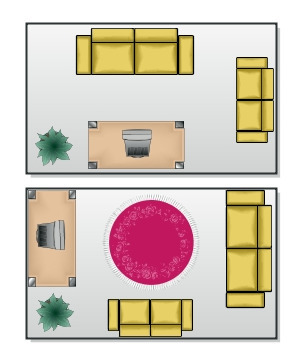 I have tried to show this in the before and after floor plans above and have added the pink rug to show the amount of floor space you may gain if this is an option.